Five days before the movie Concussion hits theaters, one of the NFL’s brightest young stars took a running start and launched himself head-first at the earhole of an opponent’s helmet. This was one of three unnecessary roughness fouls Odell Beckham Jr. received during a loss to Carolina on Sunday afternoon, and on Monday, the 23-year-old receiver was suspended for the Giants’ Week 16 game. 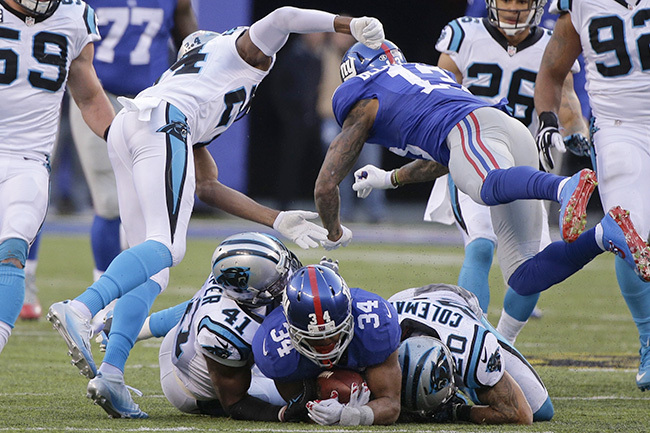 The NFL reprimanded Beckham for initiating “forcible contact” with the head of a defenseless player, Carolina cornerback Josh Norman, putting Norman at unnecessary risk for injury. In other words, the very kind of collision that football at all levels is trying to avoid. Never has there been more of a spotlight on, and awareness of, the risk of brain injury in America’s Game. Ten years ago, a movie bluntly titled Concussion would most likely never have been made. But on Christmas Day it will be out at theaters across the country. Viewers will take in popcorn, soda and the story of how the degenerative brain disease chronic traumatic encephalopathy (CTE) was first discovered in deceased NFL players. Will Smith plays Bennet Omalu, the forensic neuropathologist who performed the autopsy of Hall of Fame Steelers center Mike Webster in 2002 while working for the Allegheny County Coroner’s Office. Webster died at age 50 after experiencing dementia and depression, and Omalu found in his brain the tangles of tau protein consistent with CTE, which had previously been recognized in “punch-drunk” boxers. • WE WATCHED CONCUSSION WITH 70 RETIRED PLAYERS: The special screening brought out plenty of emotions. And for many, it was a panic-inducing horror flick. So now that the NFL’s health and safety crisis has gone Hollywood, what effect will it have? The league’s past history of inaction concerning head trauma was detailed in the book League of Denial, by Steve Fainaru and Mark Fainaru-Wada, and in the subsequent PBS Frontline special in 2013. But now the dangers of the game have been dramatized on the silver screen, with a megawatt actor (Will Smith) and a love story tacked onto the side, more accessible than ever to moms and dads who will make decisions about whether or not their kids will play football. Goodell was speaking after a presentation announcing the three winners of the second Head Health Challenge, an open innovation program sponsored by the NFL and GE to invest up to $20 million in new technologies that may be able to better diagnose or prevent traumatic brain injuries. The winners announced that day included an underlayer for synthetic turf to soften blows against the playing surface; a new impact-mitigating helmet designed by the University of Washington; and a tethering system designed by the Army Research Laboratory to reduce violent head whips. • NEW ALLIES IN THE CONCUSSION BATTLE: As the NFL spends millions in grant money, one unlikely place could provide help—the U.S. Army Research Laboratory. The timing of that event was probably no coincidence, nor was Goodell sitting down with 60 Minutes for a piece on player safety that aired in November. The NFL will never be able to fully outrun its past on this issue, even after agreeing to pay $765 million to settle the lawsuit brought by 4,500 players alleging that the NFL concealed the dangers of head trauma. Now, with a mainstream movie again showcasing that past, the NFL is emphasizing the future. Beckham’s hit on Josh Norman, the Sunday before the release of ‘Concussion,’ earned him a one-game suspension from the NFL. The NFL’s athletes are seeing the movie. A spokesperson for Sony Pictures, which made the film, said well over 100 current and former players and their families have seen the movie at screenings across the country. The NFL Players Association showed the movie to its staff last week at its D.C. headquarters, and its local chapters have arranged viewings for groups of retired players, like the one The MMQB attended in Atlanta. On a regularly scheduled conference call with the union’s player reps last week, NFLPA executive director DeMaurice Smith also encouraged them to see the movie when it comes out. The Sony spokesperson said, to his knowledge, no one at the league office has seen Concussion in advance of its Christmas Day release. None were invited to screenings, but many employees at 345 Park plan to see the movie after it hits theaters. They should, and they should admit that they have. It would be a bad look to turn a blind eye or try to repress the subject matter covered in the movie—perhaps a lesson learned in 2013, when The New York Times reported that ESPN pulled out of the Frontline project after Goodell expressed his displeasure with the documentary’s direction at a lunch with network executives. The TV special then garnered appeal as the so-called documentary the NFL doesn’t want you to see, a narrative the league has taken care not to play into with this film. Perhaps that’s why the Concussion filmmakers felt comfortable using real NFL game footage in the film and its TV trailers without consent from the league. Fair use of copyrighted material for storytelling does not generally cover commercial use—this is why the HBO TV series Ballers, for example, used NFL logos in the episodes but scrubbed them from show trailers. But Sony had to figure the NFL wouldn’t take on the PR hit of going after the movie over copyrights. Concussion director Peter Landesman reached out last fall to Paul Hicks, then the league’s top communications executive, to try to set up a meeting, as originally reported by the Times via correspondence uncovered through the Sony e-mail hack. Landesman never followed through on meeting with Hicks or the league, nor did he send them the screenplay. That works in the favor of both sides, who can say the NFL had no influence on the content. Hicks left the NFL earlier this fall to join the Glover Park Group, where he now provides external P.R. advice to the NFL, including on health and safety matters. (It stands to reason that the league’s strategy for responding to Concussion would fall under that umbrella). The NFL, like any big business, routinely takes the temperature of fans via surveys and focus groups. Within the last 10 years, those questionnaires have asked fans how they want to see the league address player health and safety. The answers have centered on wanting to see the NFL seek solutions to make the game safer. There have been 39 rules changes to promote player health and safety in the past five years; the institution of concussion protocols, unaffiliated neurotrauma consultants and injury spotters at games; and an investment of tens of millions of NFL dollars into research and technology devoted to brain injuries. But the work is ongoing, as illuminated earlier this season when Rams quarterback Case Keenum was allowed to stay in the game despite showing signs of being dazed after hitting his head hard on the turf. A few weeks later, NFL Network reported the league plans to impose discipline, whether fines or suspensions, for teams failing to properly follow medical protocol. A similar example occurred the following week, when Ben Roethlisberger wasn’t checked after taking a tough hit on a Seahawks roughing the passer penalty. After the series ended, though, the Steelers quarterback self-reported concussion-like symptoms to the team’s medical staff. “A cultural change that not only has an impact on the NFL, but all sports,” Goodell said. The NFL’s contributions to head trauma research came under fire on Tuesday, with an ESPN report alleging that the NFL vetoed a plan for a portion of a $30 million research grant, one the NFL had declared would be “unrestricted,” given to the National Institutes of Health in 2012 to be used to fund a Boston University study that aims to diagnose CTE in the living. Right now, the disease can only be detected posthumously, but changing that would be an important step to allow doctors and scientists to better understand the disease and treat patients. The ESPN report alleged that the league had an issue with the leader of the BU group, Robert Stern, who has been critical of the league. The NFL refuted the report, saying that NIH independently decides how to use the funds; The Foundation for the National Institutes of Health also issued a statement saying the NFL was willing to fund the BU study, but that NIH decided to fund that particular project on its own and instead use the NFL funds for a second study on CTE next year. It’s true that there are two categories of head trauma research that don’t necessarily have the same end game in mind. One is developing better technology to prevent, diagnose and treat concussions, to allow an inherently violent game to be played in a safer way. The other is trying to define the link between football-related head trauma and long-term neurological impact, to quantify exactly what the risk of the game is. Knowing that some former football players have suffered from CTE is one thing; understanding why, how many and what can be done about it is something else entirely. Concussion reminds the American public why those questions are being asked, and the importance of coming up with answers. Davis, the Panthers’ NFLPA rep, is among the players who plan to see the movie. Earlier in Carolina’s so-far undefeated season, Davis saw his team exercise patience when his linebacker partner, Luke Kuechly, sat out three games after suffering a Week 1 concussion. The NFL can’t change its past, but it can change what happens in the future. If You Give a Mouse a Concussion . . .